Hypertension has become a worldwide epidemic; it is estimated that about 29% of the world’s population will have hypertension by the year 2025. 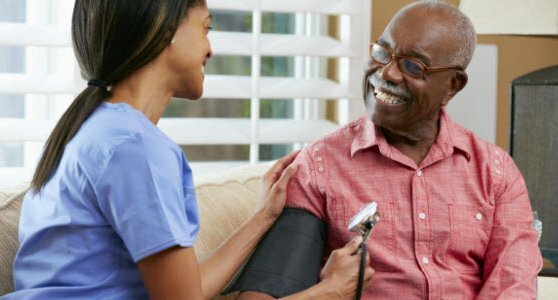 In the United States, more than 80 million people live with hypertension, and the disease occurs in a more severe manner amongst African American males. Hypertension is one of the primary risk factors for strokes, heart attacks, and chronic kidney disease. Awareness, prevention, and treatment are essential in controlling this public health epidemic in our community. To help explain what exactly hypertension is, think of your blood vessels as a sophisticated piping system, and the heart as the main pump that feeds all the pipes. These pipes go on to supply oxygen and nutrients to every living tissue in your body. If the pipes, meaning your blood vessels, become clogged or get narrow, your heart must pump extra hard to push blood through the smaller opening. This causes your heart to exert more pressure and force to pump the blood out. “Hypertension” is just the medical term for this increase in blood pressure. Research has linked certain environmental and genetic factors that have been known to contribute to the development of this disease. Poor diet, specifically excess salt or alcohol intake, can increase the risk of developing high blood pressure. Being overweight or obese can contribute significantly to the development of hypertension. The more you weigh, the more blood you need to pump to supply oxygen and nutrients to your body. This increase in circulating blood causes an increase in the pressure in your blood vessels, leading to hypertension. In addition to excess weight, stress and lack of physical activity can increase your chances of developing high blood pressure. Furthermore, hypertension tends to run in families, suggesting that there is a genetic component that contributes to the development of this disease. Researchers have found that there may be a gene that makes blacks more salt sensitive, and thus increasing their risk of hypertension. There is a sizable national disparity when it comes to the number of men suffering from hypertension in the United States. 41% of African Americans males live with hypertension, versus 27% of whites. According to the Center for Disease Control and Prevention, “a larger percentage of African American men [have] had elevated blood pressure than [have] African American women, white or Mexican American men.” Furthermore, blood pressure naturally increases with age, and the risk of hypertension begins to rise around the age of 45. However, black men are more susceptible to developing a more acute form of the diseases at a younger age. Research has determined to an extent that hypertension in black American males is due to certain circumstances that are unique to them. Poor social, economic status/ economic inequality, poor access to healthcare, and the systematic effects of racism and discrimination have been thought to contribute to poorer health outcomes in black men. Other factors that have been linked to the increased prevalence of hypertension in black males include the higher rates of obesity and diabetes amongst African American families. Prevention of hypertension is crucial, and the first step to prevention is diet control. Cutting down on high carbohydrate foods such as sugary cereals, bread products, and sweet drinks, and consuming plenty of fruits and vegetables and low-fat dairy products, can help significantly control your blood pressure. Another effective way of managing your diet is through portion control. The saying “too much of a good thing is bad for you” proves to be true when it comes to controlling your blood pressure. Know when to say ‘I am full,’ because grabbing that extra chicken wing can have some detrimental consequences to your health. Furthermore, many studies have shown that lowering your salt intake lowers your blood pressure. The CDC recommends less than 2,300 milligrams of sodium a day as part of a healthy diet. Along with a healthier diet, staying active helps prevent and reduce high blood pressure. According to the America College of Sports Medicine’s guidelines on exercise and hypertension, “exercise training lowers blood pressure in 75 % of people with hypertension.” So, get motivated and sign up at your local gym or utilize your local park. Exercising 3-4 times per week can help improve both your mental and physical health. Lastly, certain lifestyle changes can aid in the prevention and control of hypertension. Too much alcohol consumption and tobacco smoking can increase the rate of hypertension. Men who consume alcohol should adhere to no more than two drinks a day. Harder said than done, but if you are conscious about your health, take a vigorous stance. Furthermore, cigarette smoking does not only increase your chances of developing hypertension, but it can lead to a whole hoax of medical problems, such lung and bladder cancer, emphysema, COPD, and asthma. So, get strict about quitting and don’t be afraid to seek help. Before starting a new therapy, diet or lifestyle change, it is always advisable to consult your primary care doctor. Finally, hypertension is known as the silent killer because most people do not develop symptoms until their blood pressure is well above the normal range. Therefore, it is extremely beneficial to have your blood pressure checked at least once or twice a year by your primary care doctor.